This is what the box looks like from the backside with the duct tape removed. 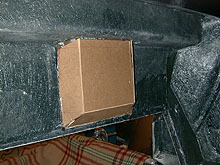 It's amazing how strong the box is already with just one layer of fiberglass cloth on the outside. 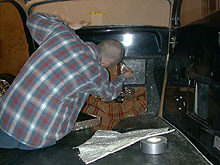 Joey Keyman applies a coat of resin to the box prior to applying the fiberglass mat. 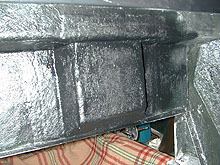 We scuffed the surface in order to achieve a good bond and pre-cut or fiberglass mat to fit. We centered the mat on the box and started dobbing it a resin soaked brush working all the bubbles out in making certain the mat was entirely saturated with resin. 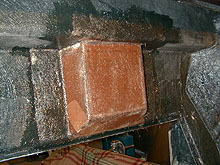 When applying fiberglass mat you need to be careful not to pull brush through it and tear the mat. We found that just dobbing it with a resin soaked brush worked the best. 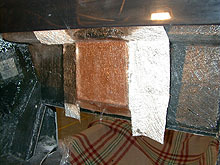 The box was covered with three layers of fiberglass mat. 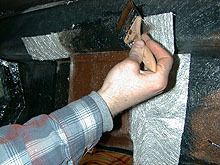 We waited a short period of time between each coat but not long enough for the resin to dry. This shot was taking the following morning after spraying a coat of flat black paint over our newly formed box. The box is incredibly strong and looks (at least from the backside) as if it's always been there. Next will start finishing the front firewall side.